Amazon Go has been called the future of retail and the demise of humanity. So, naturally, we just had to check out this much-discussed store without cashiers when one opened downtown Chicago. 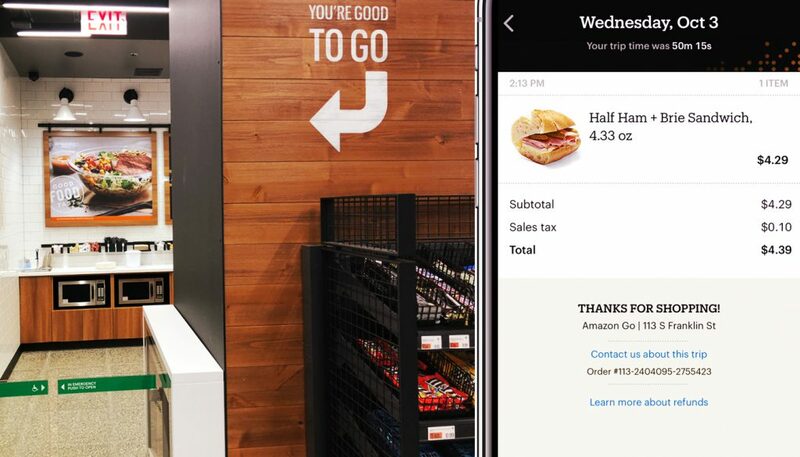 Whether you like it or not, Amazon Go is defining a future for convenience. Some context: Amazon Go grocery stores, piloted in 2016 and expanded to multiple locations, have quickly captured the attention of retailers because the stores remove friction from shopping and paying. You simply scan a special Amazon Go app when you walk in, take goods off the shelf, and leave. You don’t need to stand in a line and have a cashier ring up your purchases. 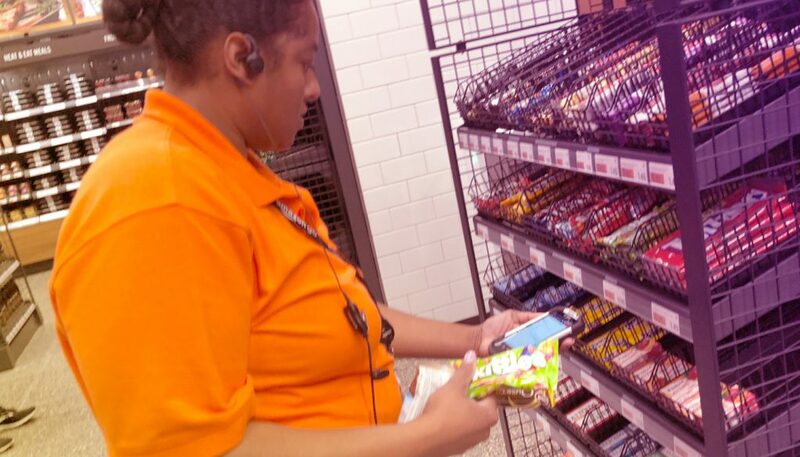 You don’t need to go through a self-checkout line. You sail out the exit, no muss, no fuss. To enable this seamless way of shopping, Amazon requires you to have an Amazon account and an Amazon Go app on your phone. That’s it. The app is linked to the payment information stored on your Amazon account. Once you are in the store, an intricate set of sensors and cameras track your every moment, including, importantly, which merchandise you take off the shelf. You are not charged until you leave. The set-up is as easy as advertised so long as you are an Amazon customer. You simply go to the App Store, download the App, and do some minor administrative tasks. The hardest part is knowing that you’re even supposed to find an app to do the set-up. Amazon doesn’t promote Amazon Go heavily on its website. You have to do a little searching to understand the process. Perhaps Amazon is letting the Chicago store sell itself instead of giving it a heavy promotional blitz in order to manage the crowds (the store itself is small, akin to a convenience store). Or maybe Amazon wants to court the early adopters, who are more likely to take the time to figure out how to download the app on their own. In any case, the app itself is easy to use. 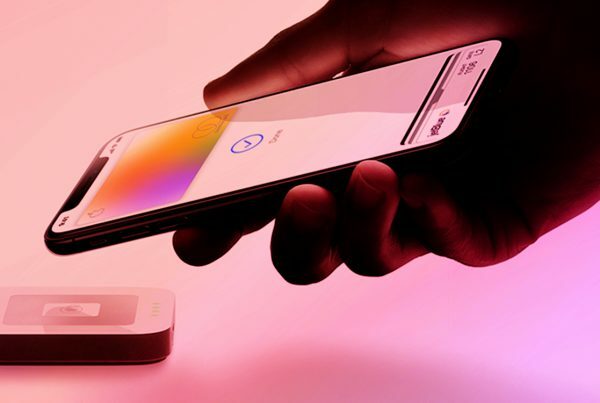 It tracks all your payments and, as we discovered, tracks receipts and inventory at Amazon Go stores so that you know what to expect to find on the shelves. The Franklin Street location is key. The store is conveniently located in the lobby of a sleek office building that counts among its tenants businesses such as Citi and Credit Suisse. The store is adjacent to a Starbucks, as well. The ideal location ensures a steady stream of shoppers. During our visit, the store was humming with activity as shoppers stocked up on snacks, soda, and other easy-to-carry merchandise. The location also ensures that the store caters to an affluent audience of professionals with little time for shopping. It’s interesting to note that Amazon stocks the store with plenty of ready-made dinners that can be microwaved or simply eaten as-is. The store also provides microwaves to prepare the food. But there is no place to actually eat the food. Our assumption is that Amazon is catering to people who buy their lunches and take them back to their desks or employee cafeterias, or perhaps to save for dinner at home later. It will be interesting to see whether the Starbucks next door will benefit from some spillover business as shoppers decide to find a space nearby for lunch. 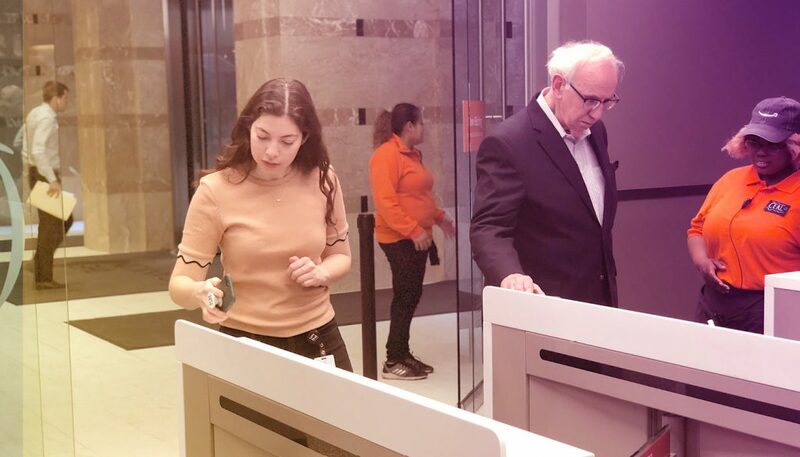 As promised, Amazon Go lacks cashiers. But that doesn’t mean Amazon Go lacks employees. We counted about a half dozen people in bright Amazon Go T shirts doing everything from stocking products to greeting shoppers. The employees were kept busy advising first-time shoppers and reassuring them that yes, no check-out kiosks were required. Because of the store’s compact size, we were more aware of the presence of employees than would be the case at a larger store such as Walmart. It’s not clear how many of those employees were permanent, however. Actually navigating an Amazon store, taking a product off the shelf, and leaving was also as easy as advertised. All we needed to do was scan our mobile phones at entry points. (Entering the store would have been even easier to use an Apple Watch to scan our Amazon app, but Amazon does not make its app available on the Apple Watch.) In fact, the experience was somewhat banal and utilitarian. You could conceivably stock up on your groceries without talking with anyone. But your experience does not end with the purchase. Your app also tracks the amount of time you spend in the store and what you purchased – data that is reported to you within minutes of your visit. Timely presentation of the digital receipt on your Amazon app is crucial. Especially if you are a new shopper, you can’t help but feel a nagging discomfort as you leave and wonder if Amazon really tracked your purchase accurately. But in our experience, it took 10-12 minutes for the receipt to appear on the app, which raises the question of how much heavy lifting needs to occur behind the scenes for Amazon to deliver the receipt. By contrast, we’re accustomed to instant presentation of the receipt in any other retail environment. This question is especially important with Amazon Go being so new, when shoppers might require more assurance that the process works. After we made our purchases, we wandered over to a nearby Target to do some price comparisons. In every case, Amazon Go’s prices were either the same or lower than the identical product at Target. In the offline world, Amazon strives to provide the same seamless purchase at a lower price – and succeeds. When people say Amazon Go is the future of retail, they usually have friction-free shopping in mind. But what really caught our attention is the prevalence of Amazon-branded products on the shelves. We couldn’t walk two feet without encountering one of Amazon’s house brands, ranging from coffee mugs to ready-to-eat meals. If you want a can of Coca-Cola or a quart of Ben and Jerry’s ice cream, you can certainly find those things at Amazon Go. 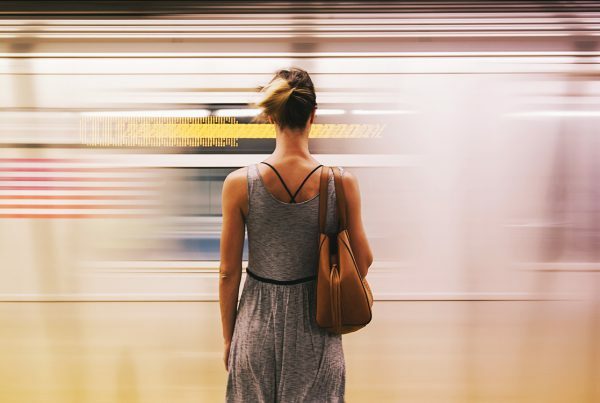 But Amazon Go is Amazon’s world – and this is the future of retail, as well as a threat to consumer packaged goods brands, a topic we have blogged about. Amazon has been developing its in-houses brands for years, but because the Amazon website is so vast, you don’t always notice them. 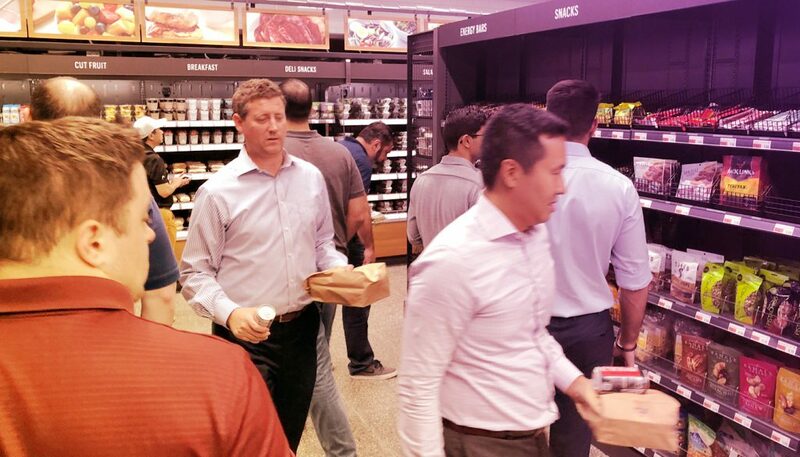 But at Amazon Go, the in-house merchandise really takes center stage, and you can better appreciate just how much of a threat Amazon is to consumer packaged goods firms. Here is Amazon’s vision: come to our store and buy our products. 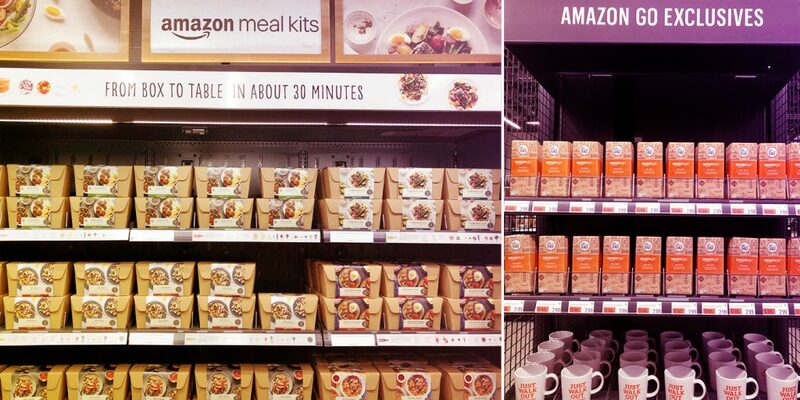 In addition, by offering curated ready-to-eat meals, Amazon is inching its way into being a lifestyle brand. 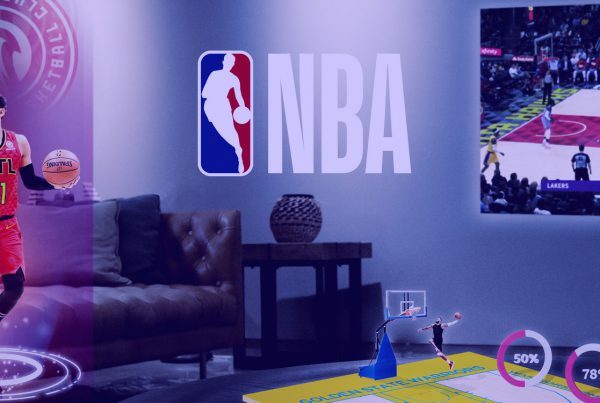 In a sense, Amazon peddling its own branded merchandise reflects how Amazon is creating its own branded experiences elsewhere, ranging from smart speakers to entertainment. We truly are living in Amazon’s world. Convenience is the lure. The product is the payoff – for Amazon and its loyal customers. Note: Walmart recently answered Amazon recently with the launch of its own version of Amazon Go, Sam’s Club Now. We’ll comment on this development in a future blog post.